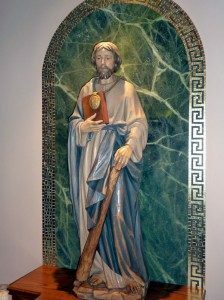 St. Jude, Apostle of Christ, you have taught us to build all things on the foundation of faith, to pray in the Holy Spirit, to keep ourselves in the love of God and to look forward to the mercy of our Lord Jesus Christ that leads to eternal life. Pray for the Church that is built on the apostolic witness and word. Pray that we may receive the fruit of the Spirit of God: love, joy and peace, patience, kindness and generosity, faithfulness, gentleness and self-control. May we grow in understanding and forgiveness and be free from every fear. With these strengths of heart and mind may we persevere in a holy life. Amen. Now to him who is able to keep you from falling and make you stand without blemish in the presence of his glory with rejoicing, to the only God our Savior, through Jesus Christ our Lord, be glory, majesty, power and authority before all time, now and forever. Amen. to the only God our Savior, through Jesus Christ our Lord, be glory, majesty, power and authority before all time, now and forever. Amen.